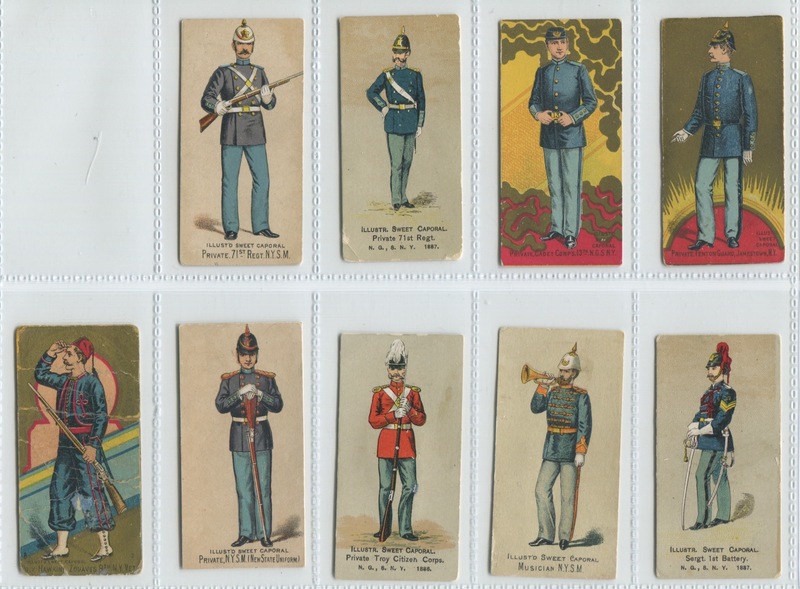 The N224 Kinney Military set is the largest 19th century chromolithographed set from any of the large manufacturers of tobacco cards. 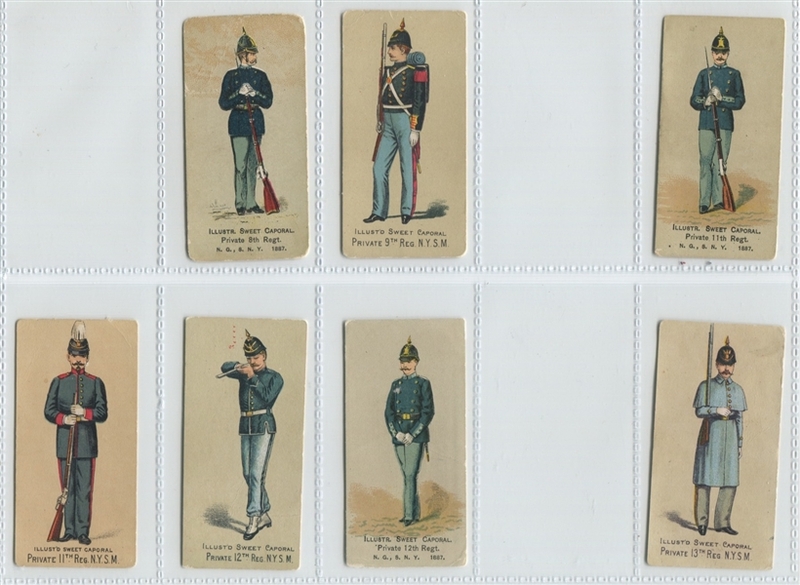 The set numbers 622 different subjects, and, while the cards are easy to find, there are no known complete sets of the cards. To make it over 600 cards is the first big achievement in collecting this set. Each card above 600 becomes much more difficult until you reach the last 10-12 cards which rarely, if ever, come up for sale. The cards were issued in thirteen series, most of which had 50 cards. 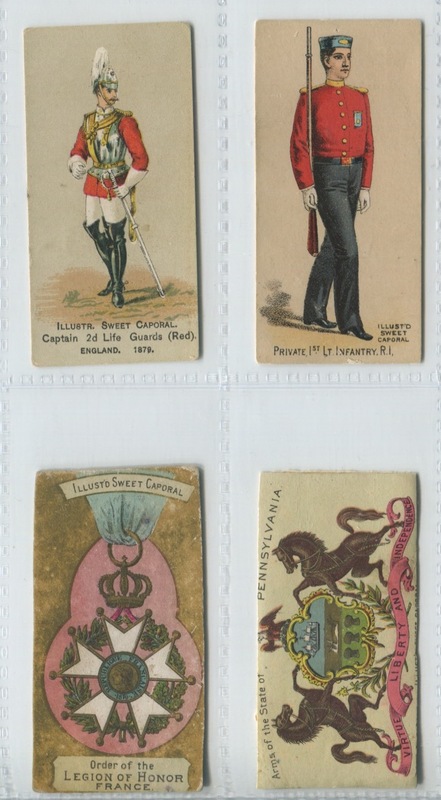 Little is known about how they were marketed or how the series were issued and distributed. 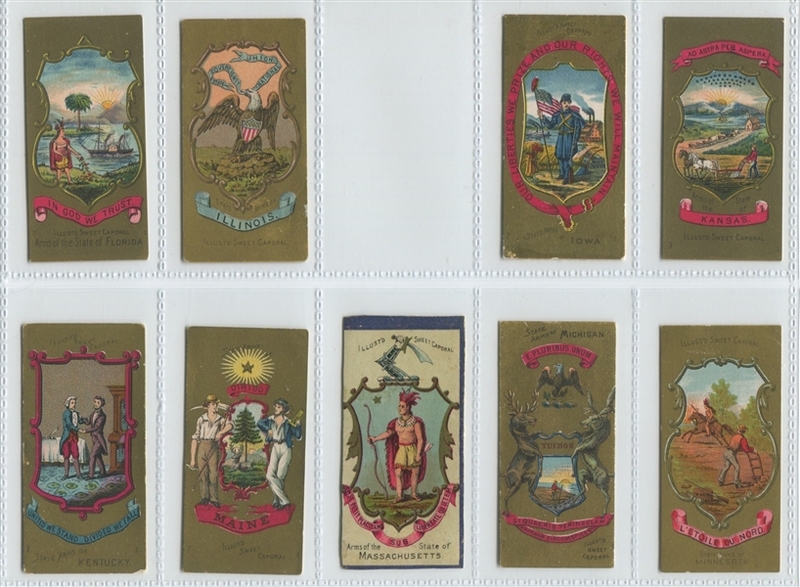 Some of the series are prohibitively tougher than others--particularly cards from series J and F. Series K and I cards are also more difficult. 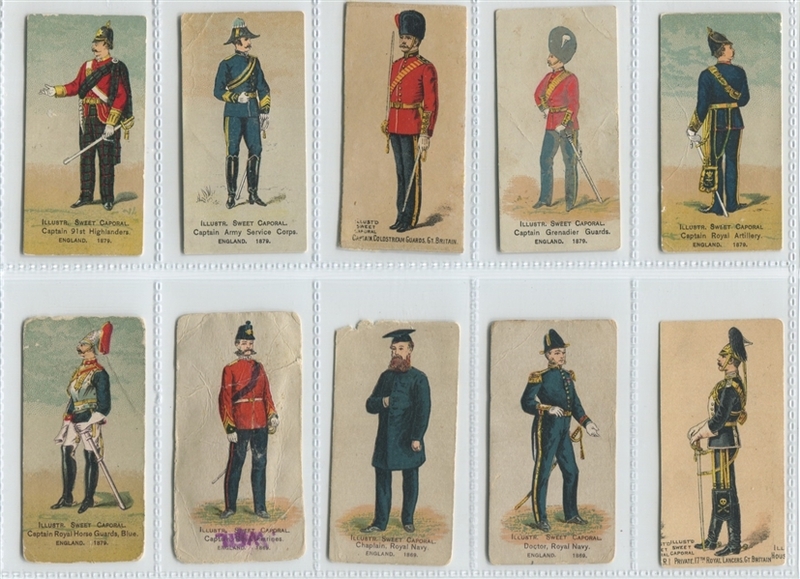 There are back variations to the cards for the completist and there are background variations for a number of the cards. 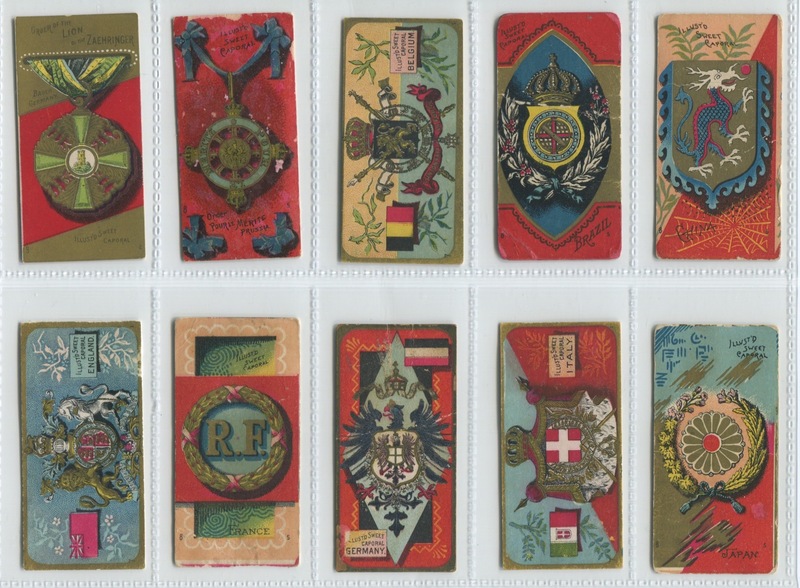 The state crests and decorations typically bring stronger prices although most of them aren't any more difficult than some of the regular cards. The three Vatican cards are more difficult and are always in demand. And finally the tougher NGSNY (New York) and England cards are among some of the toughest cards to obtain. 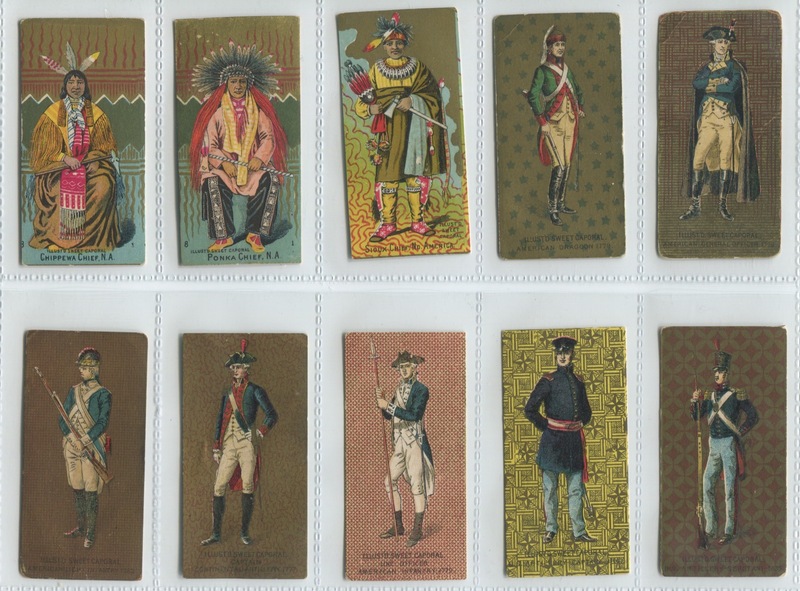 Advanced collectors track the cards in this set very diligently. Known groupings include sets of 621, 620, 618, 611, 611 and 608. The 621/622 set belonged to Sir Wharton-Tigar and now resides in a museum in the UK. 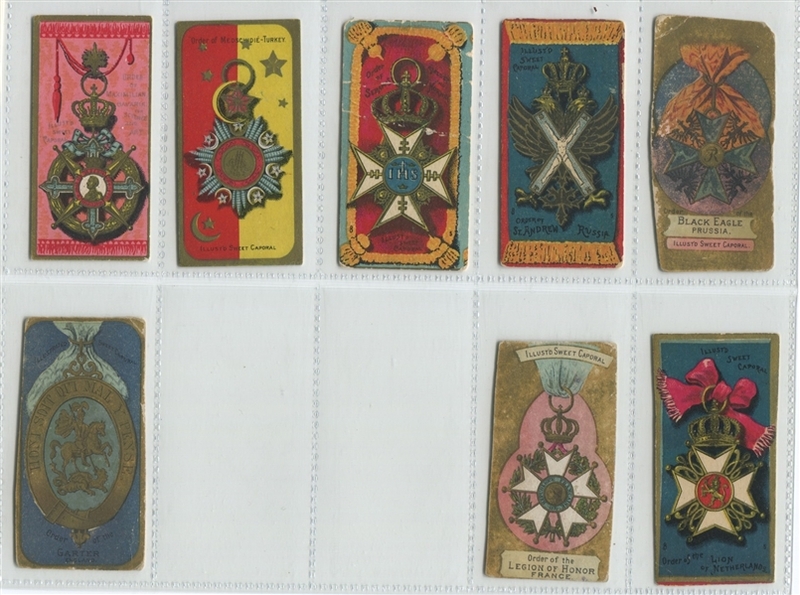 That collection is missing only the Huzzar of France which is present in 2-3 of the other collections listed. This near set totals 589 of 622 and is likely one of the better groupings without being at 600 cards. 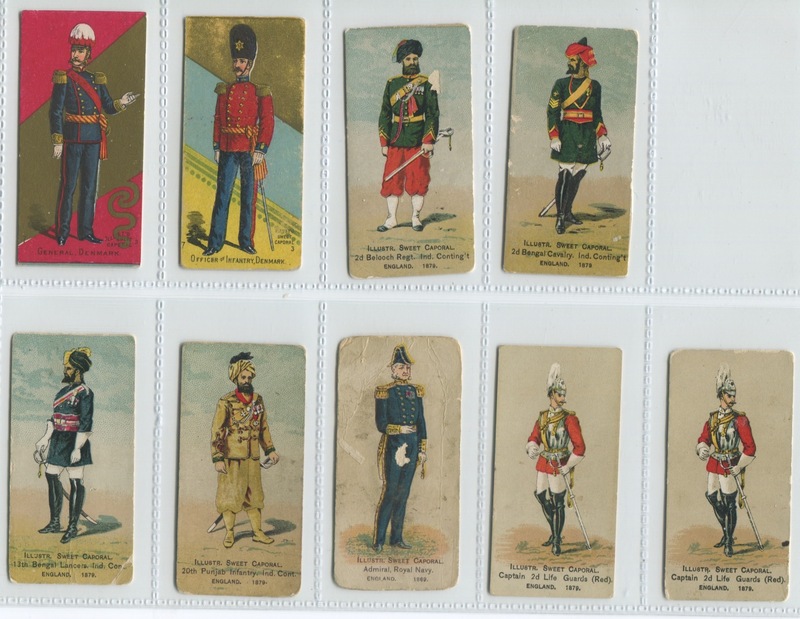 The 33 cards missing include the following numbers: 167, 168, 181, 184, 185, 189, 193, 194, 197, 198, 201, 211, 277, 288, 291, 315, 323, 324, 326, 327, 334, 340, 341, 380, 406, 443, 446, 473, 478, 488, 579, 607 and 608. The majority of these cards are NGSNY or England cards or some of the most difficult final 10-12 cards. 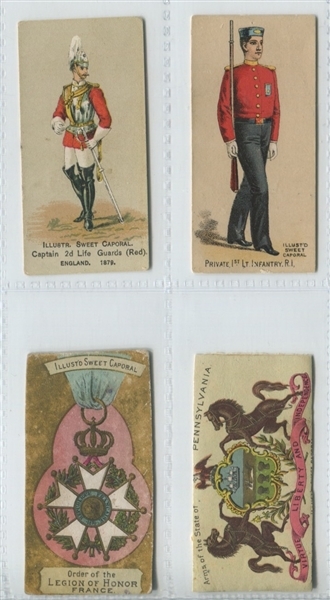 The condition of most any lot or near set of N224 cards can, at best, be described as a 'mixed bag'. This near set is no exception. 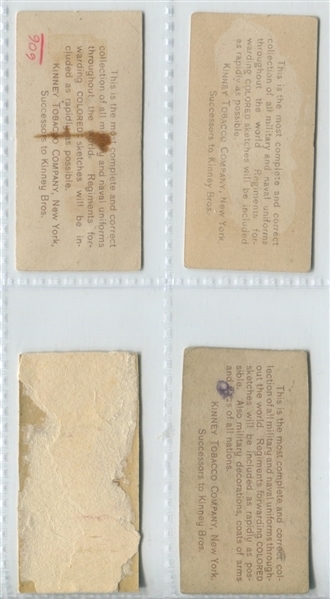 Old time hobbyists frequently wrote the card number from the known checklist on the back of the card and a number of these cards have that number written primarily in pencil but a few in pen. Approximately 5-10% of the cards also suffer from some amount of paper loss which is entirely common for a grouping this large. A similar number suffer from some type of creasing from just a small crease to moderate creasing. When it comes to the technical grading of this near set, approximately 50% of the cards grade in a VG to EX range without regard to any pencil writing on the back. The remainder of the cards are pretty evenly split between Poor, Fair and Good grades with back damage, pen writing and light to heavy creasing moving cards into those groups. A number of pages of front images have been scanned and one back page scanned to give you an idea of the condition of the near set. If you have specific questions about specific cards, please let us know. 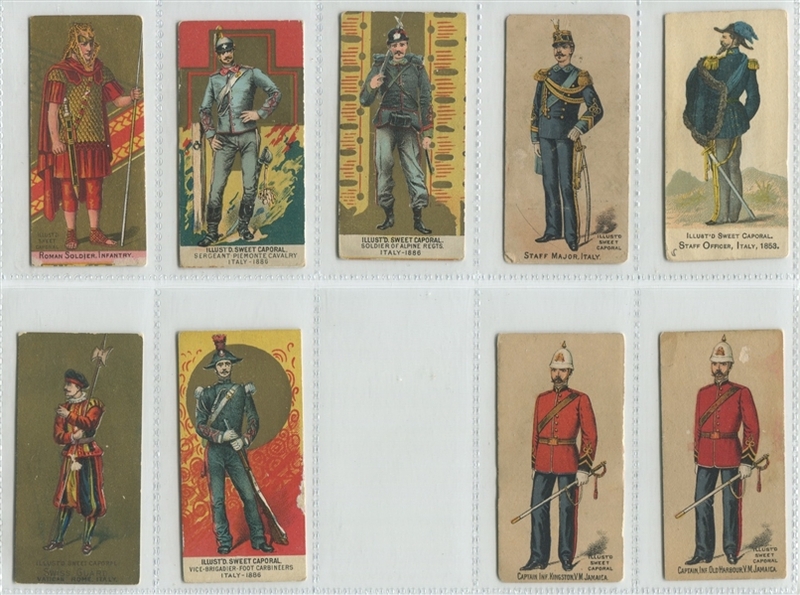 This near set offers a rare opportunity to acquire 95% of the set in a single transaction. Lots of this size typically trade in the $5000-$9000 range. This lot was originally listed with the text "326, 3434, 340," which should have read "326, 327, 334, 340," and has since been changed above. 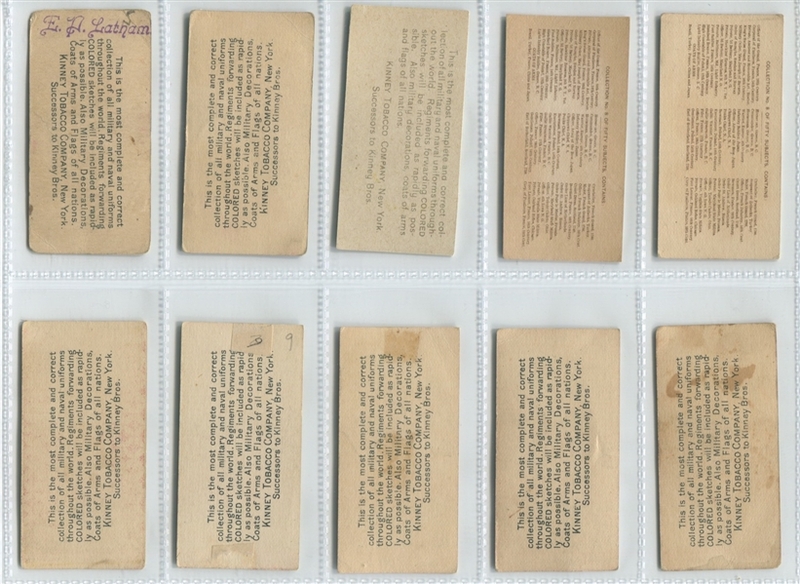 After being contacted about some specific cards in the set, I audited the near set one by on against the gallery. The total moved from 588 to 591 cards. The missing cards are mostly the same but they are: 12, 143, 167, 168, 181, 184, 189, 193, 194, 197, 198, 201, 211, 235, 315, 319, 323, 324, 326, 327, 334, 340, 341, 380, 443, 473, 478, 488, 579, 607 and 608. A total of 31 missing cards. In addition, 9 cards that are present are possible/probable poster cut outs. They are: 164, 227, 240, 268, 275, 283, 444, 485, 610. Auction closed on Sunday, January 27, 2019.